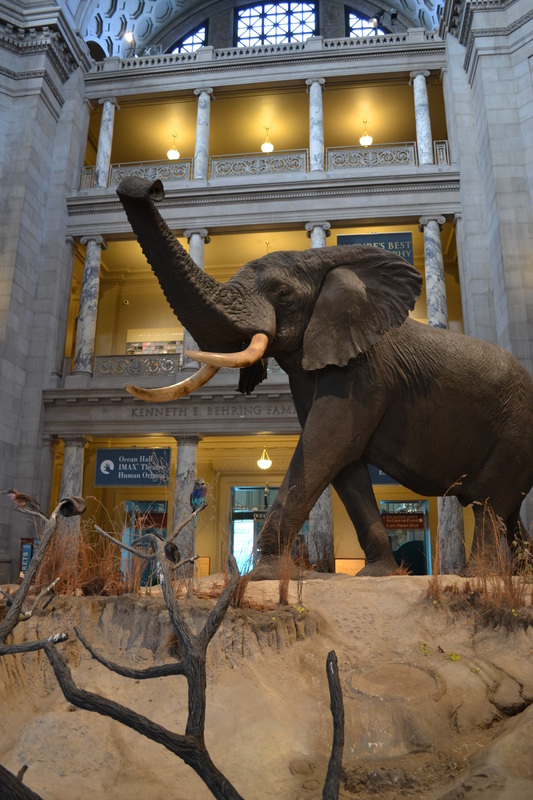 In part one of my guide to the Smithsonian Museums in Washington, D.C. I touched on the highlights of what to see in the museums on the south side of the National Mall. This section is about the best of the best on the north side of the Mall, as well as the museums off of it which I was able to visit. Just like part one, it is not intended to be a comprehensive guide. Instead it is only meant to give visitors an idea of what is on display. For a more in depth look, I suggest picking up a copy of the Official Guide to the Smithsonian. Between my copy, and the museum’s excellent social media teams for the various museums I communicated with on Twitter, I was able to find everything I circled during my planning and then some. I continued an already busy day at the Natural History Museum, one of the best museums under the Smithsonian umbrella. I say I continued it, since I spent the morning wandering through the two National Gallery of Art buildings between it and the U.S. Capitol building. More on that in another story, though. First, here’s a quick guide to the Natural History Museum. I’ll be honest. Natural history museums kind of freak me out. The attraction of seeing stuffed animals in a fake display of their habitat gives me the willies for some reason. 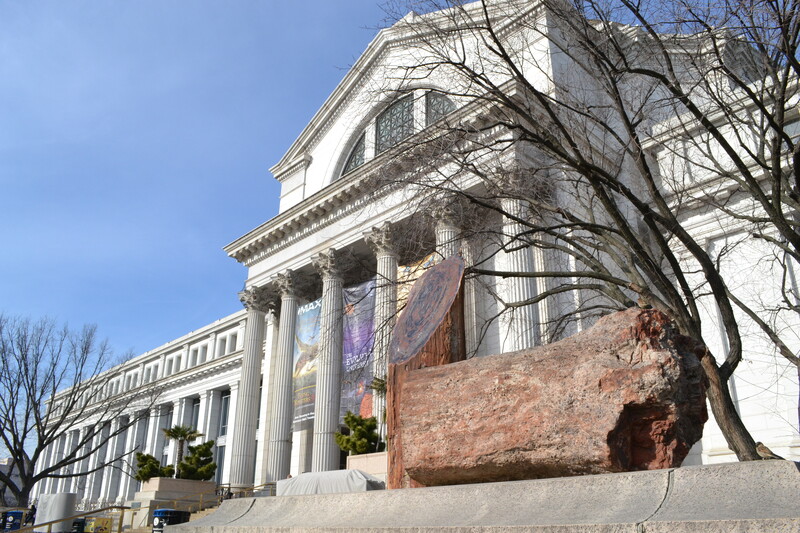 But I couldn’t travel to Washington, D.C. and not see the Natural History Museum, not with all of the amazing things inside – the dinosaur bones, the 45.52 carat Hope Diamond, Marie Antoinette’s earrings, and so much more. After walking through the main entrance to the museum off the National Mall, pausing to take in the amazing rotunda lobby, I took a right and walked back in time a few million years. I was there, surrounded by dinosaurs of all kinds, something which to this day fascinates me. I guess it takes me back to the days of my sandbox where I flooded it and all of the dinosaurs I had set up inside, just as I talked about in my post on Mammoths and Mastodons at the Denver Museum of Nature and Science. 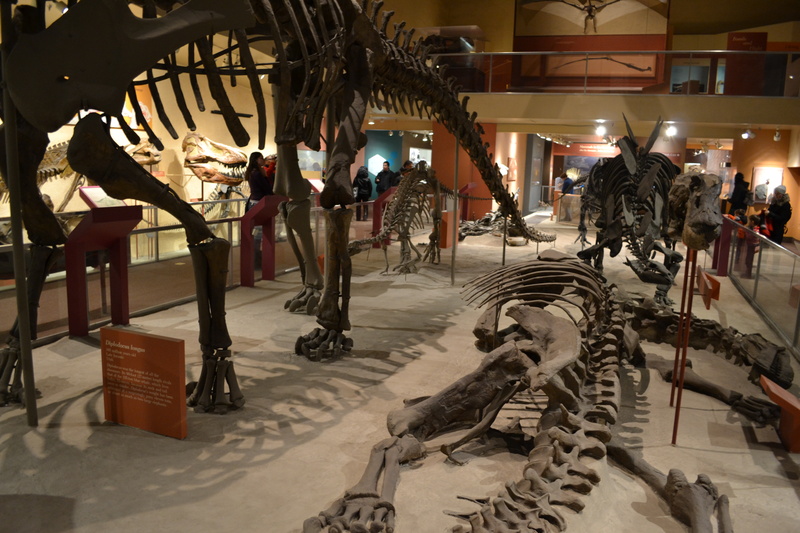 The bulk of the first floor’s east wing is about dinosaurs, fossils, and the ice ages. 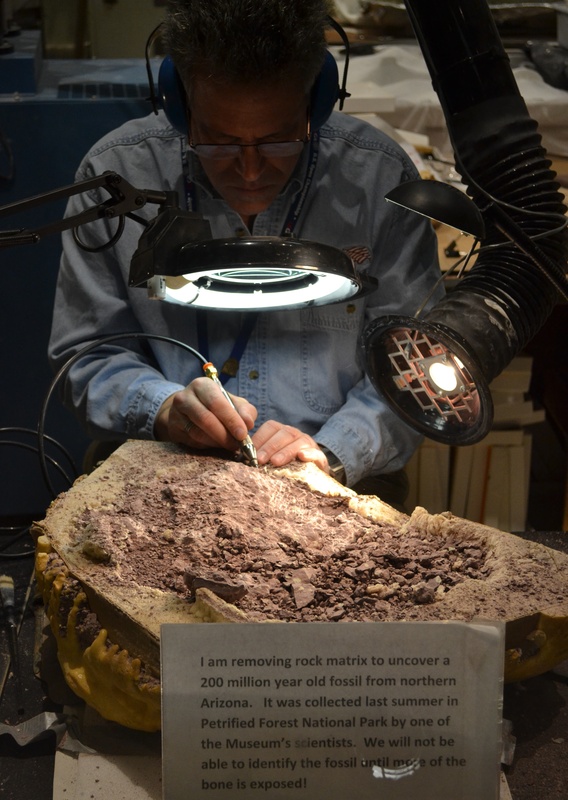 There’s even a chance, right in the middle of it all, to watch real life scientists work on fossils in their lab. I could have stood there for hours watching them, but with so much to see I couldn’t linger. Instead I continued on through the African Voices hall and into the Ocean Hall. I briefly wandered through the displays here only long enough to snap a few photos. As I said, seeing stuffed animals of any kind – even marine ones – freaks me out. That’s why I avoided the bulk of the museum’s west wing – Mammals Hall, Human Origins, and the Insect Zoo held no real interest for me. I only walked into the wing briefly on the second level to see the Egyptian Mummies display, but didn’t stay long since it is definitely part of the Smithsonian Museum complex that is lacking in depth. 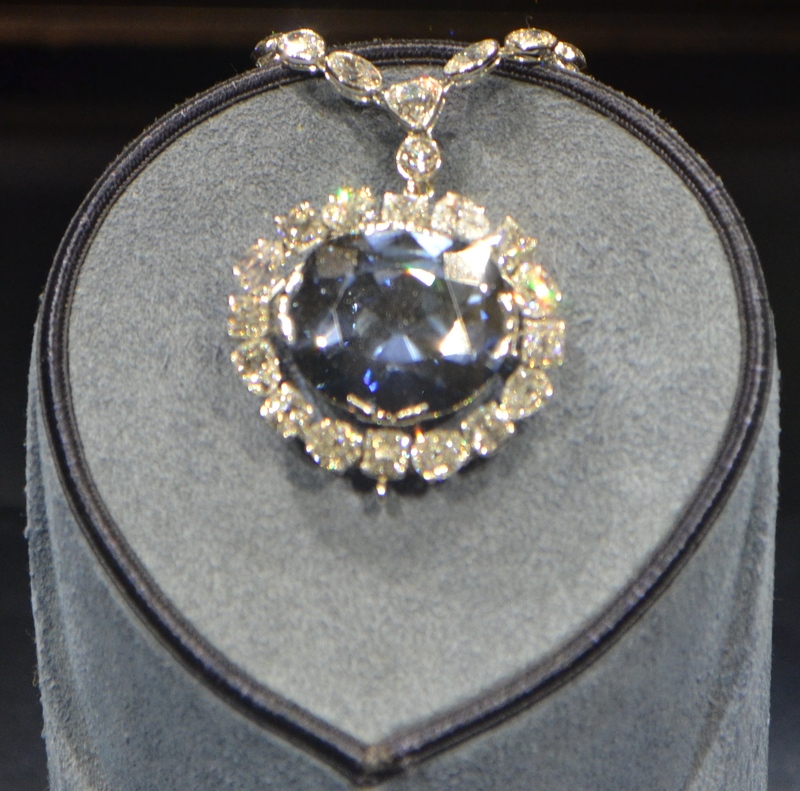 Instead I stayed to the east wing upstairs, walking right into the room with the Hope Diamond. Of all the things I imagined, this was the diamond to shame all other diamonds; it would be as large as my fist if not my head at 45.52 carats, and it would be impossible to steal, even for Oceans Fourteen or Fifteen – whatever the series is on now. But when I walked in and saw it displayed behind glass, my heart sank. It was undoubtedly spectacular, but nothing as I had anticipated. Instead it, in my eyes, was put to shame by other jewels I saw on display in the Gems and Minerals room. Continuing into the room, I was struck dumb by earrings worn by Marie Antoinette, a diadem and necklace that Napoleon gave to his second wife, and more. 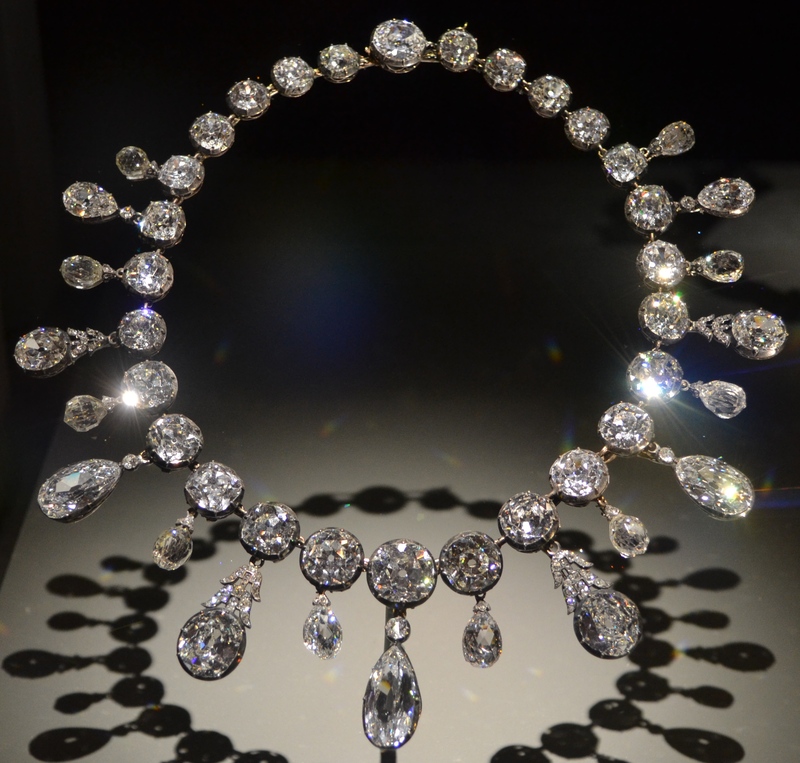 These jewels were truly spectacular, something so much more impressive to me than the Hope Diamond. 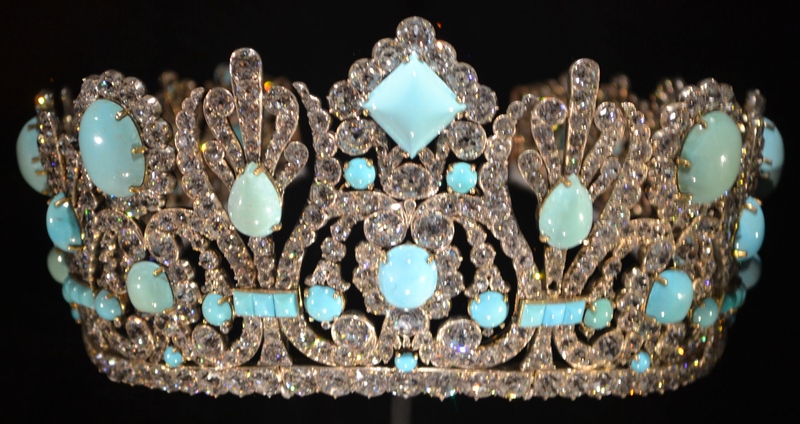 Maybe that’s because I knew more about the history of the people who wore them than I do anything about the Hope Diamond, but, regardless, they amazed me, so I planted my feet in the ground to stare at their beauty for more time than I gave any other exhibit in any of the Smithsonian Museums I visited to this point. If you only have time to visit one museum while you’re in Washington, D.C., this should be the one. There’s no doubt about it. No debate. Nothing. This is it. The one. One of several highlights of my trip to D.C., but easily the most interesting museum I visited during my week in town. And that’s saying something. I knew what lay beyond when I strode in through the main entrance. It was the Star-Spangled Banner, the flag which flew over Baltimore and inspired Francis Scott Key to pen what is today America’s national anthem. It is not possible to photograph the flag since it is so fragile, which is why I stopped in two other times during my week in Washington to see it. I was continually drawn to it, unable to walk by the museum without catching another glimpse. But with so many wonderful things to see in the museum, I couldn’t linger. I had to move on and take in as much as I could, starting one floor down from the flag on the lower level. A separate entrance opens the lower level to Constitution Avenue on the north side of the American History Museum. So if you’re coming from somewhere other than the National Mall, this is a good place to start. Why? Because if you see what’s on the upper floors first, what’s down here won’t be nearly as impressive. Seriously. Start at the bottom and work your way up. Despite everything that is on the upper two floors, don’t bypass this level. 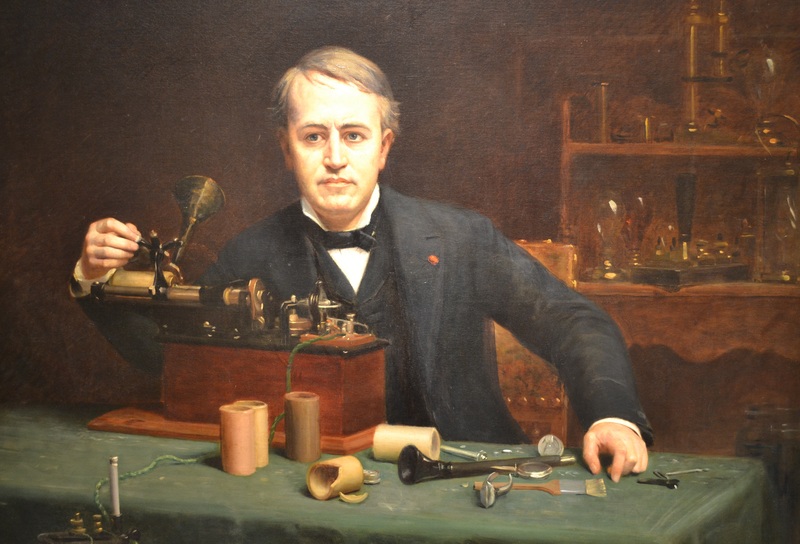 There’s a lot to see here, namely 26,000-square-foot exhibition on transportation, Thomas Edison’s lightbulb, and an interesting display on money. The rest of the lower level, when I visited, was closed off for renovations. The only other open room was the museum store, which is definitely worth a visit before heading out. Moving up back up to the main floor of the American History Museum, stop and take your time to see the Star-Spangled Banner again. I did before continuing onto the two of the four others halls on this level: American Stories and African American History and Culture Gallery. The other two – the documents gallery and Within These Walls – were of little interest to me, so I only quickly walked through. The American Stories hall on the main level is not to be missed. 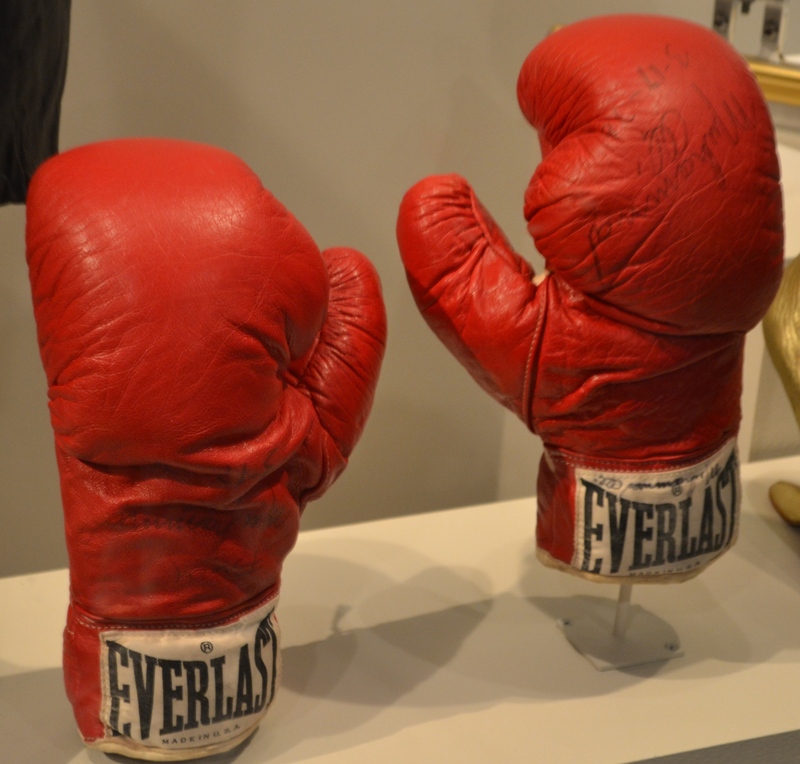 Want to see Muhammad Ali’s boxing gloves? They’re here. Kermit the Frog? He’s here. Or what about Archie Bunker’s chair? It’s here, too. All of it and more, like Dorothy’s ruby slippers from the Wizard of Oz, are right in this one room. Anything that makes America American, all kinds of fantastic Americana, is right in that one room. 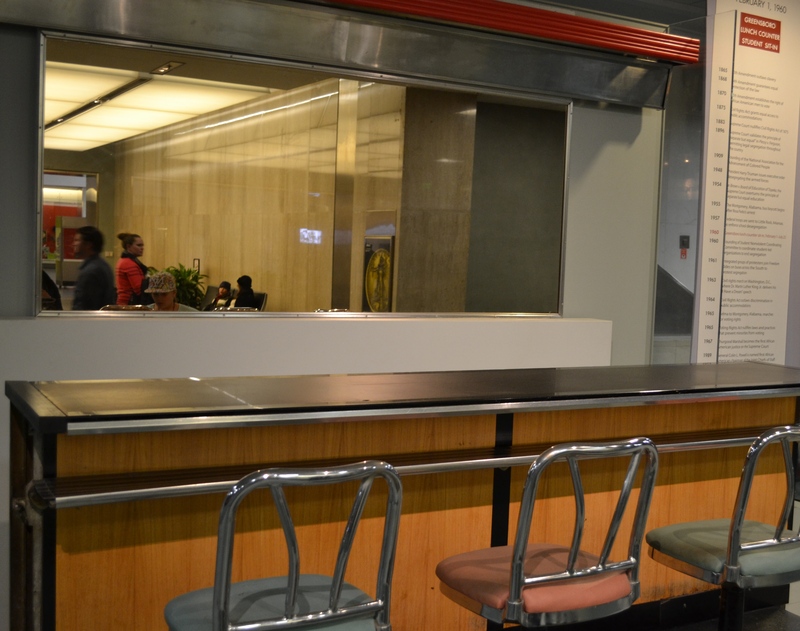 Before walking into the African American History and Culture Gallery, stop to see the Greensboro, North Carolina lunch counter. It is at this very counter in the Woolworth’s in February of 1960 that four African American students refused to leave when they were denied service. It is oddly placed in the museum, I’ll admit, but with the 2015 opening of the African American History and Culture Museum next door, hopefully it will find a better home. In the meantime, the African American History and Culture Gallery is another not-to-be-missed spot in the American History Museum. 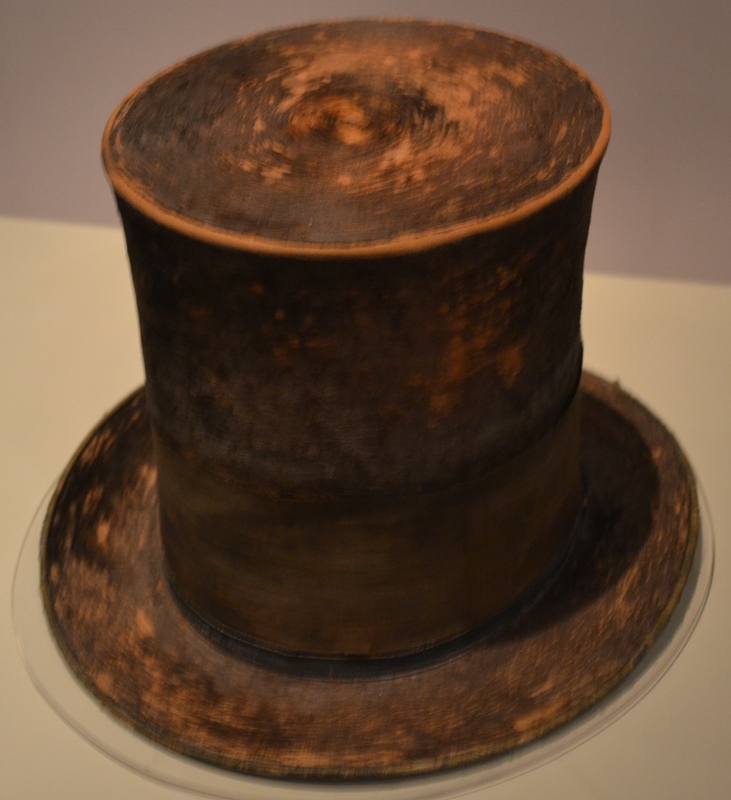 This is where you’ll find Abraham Lincoln’s hat the night he was assassinated, a highlight for most visitors. 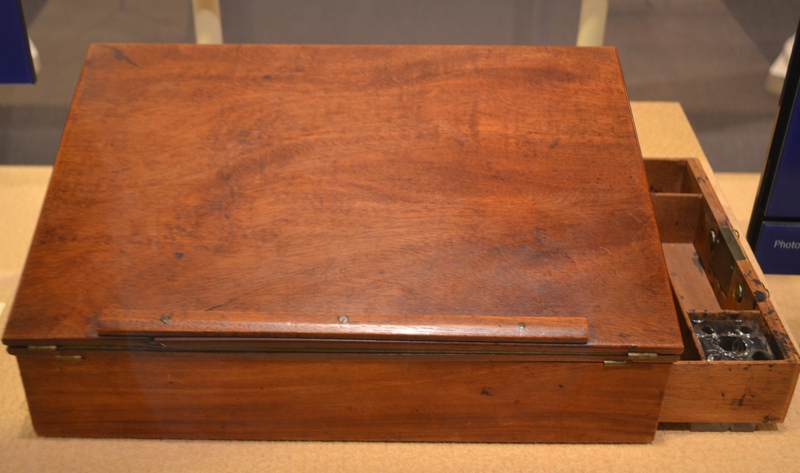 Other interesting items on display are a copy of the Emancipation Proclamation – the original copy is rarely on display at the National Archives – a brief history of the Civil War, as well as one on Civil Rights. These displays most definitely need and deserve more space, which is impetus behind the new museum. Once you’re done in this gallery, take the nearby escalator up to the third floor. Depending on your interest, you can see the four main rooms on this floor in any order. My preference is starting with the Price of Freedom, going to the Gunboat Philadelphia, then over the gallery on the First Ladies’ dresses, before continuing on and ending the museums visit with the American Presidency. This suggestion is largely because of the chronological nature of the displays, but also because the American Presidency will send you off with a figurative bang. 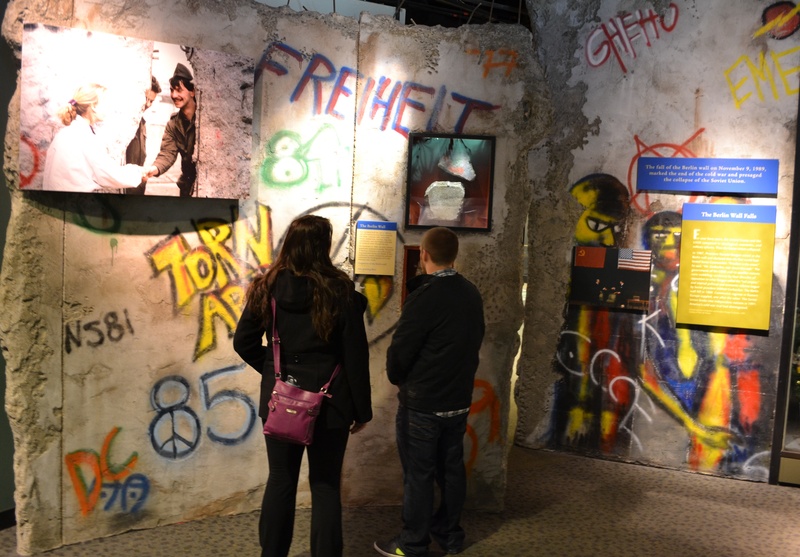 The Price of Freedom gallery is undoubtedly one of the best parts of the American History Museum. 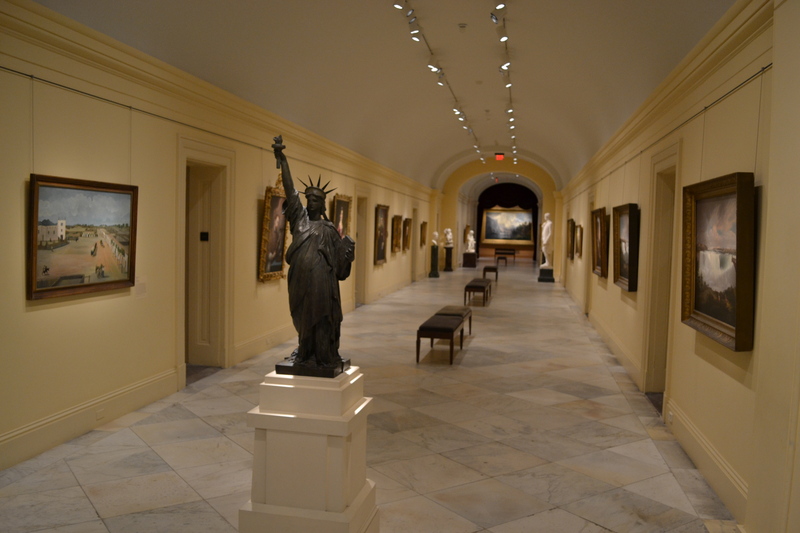 There are enough exhibits and highlights in this one gallery to make it a worthwhile museum to visit all on its own. 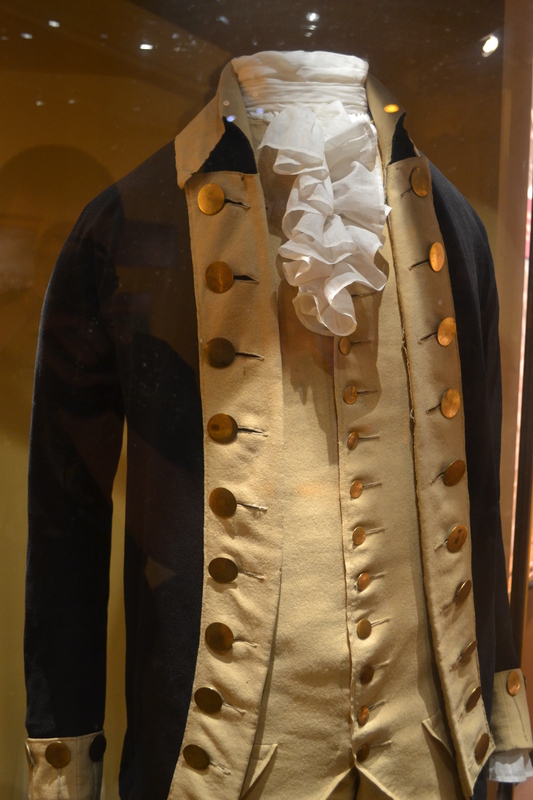 Most notably on display is the uniform George Washington wore during the American Revolution. 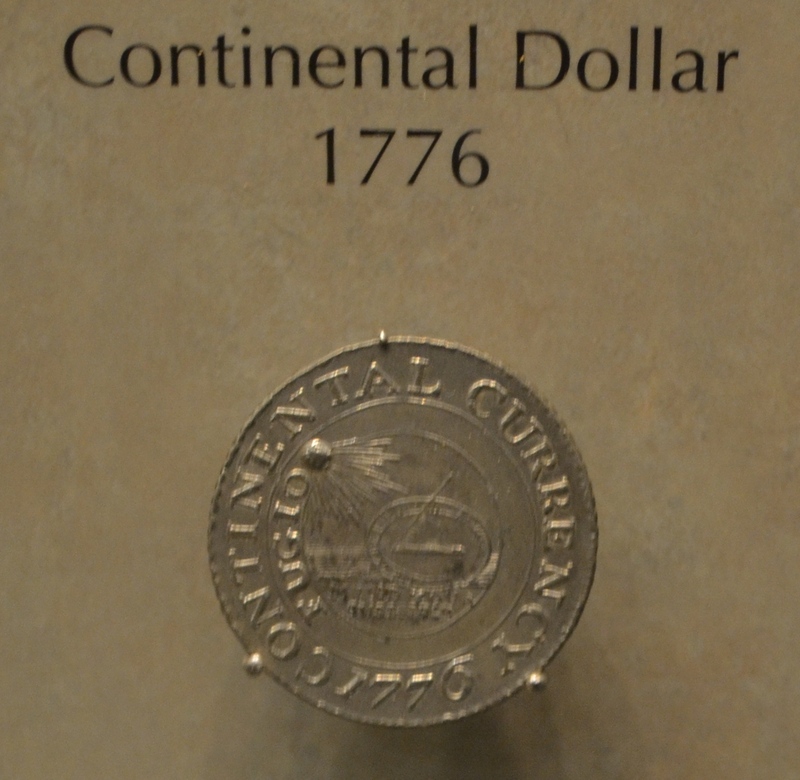 Other items, like Washington’s personal effects he had with him during the war, Cornwallis’ sword presented for surrender to end the Revolutionary War, and more current items – like a Huey from the Vietnam War and the largest section of the Berlin Wall outside of Germany – are also on display. But everything in between those two eras – the Revolutionary War and the fall of the Berlin Wall – should be given their due. There is certainly a lot to see, and this will undoubtedly be the most time consuming gallery of any out of all of the museums which comprise the Smithsonian. 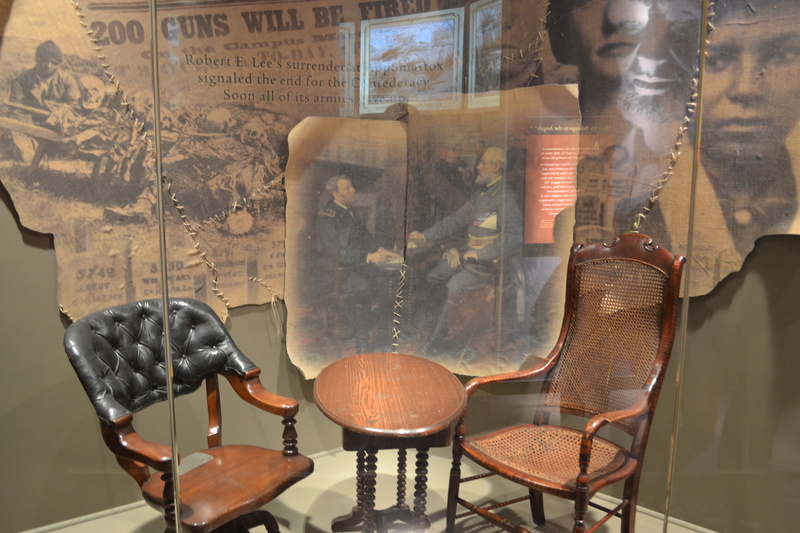 It is truly impossible to skip anything here, like the desk Lee surrendered to Grant at to end the Civil War, a huge display on the Great War as well as World War II, and still more beyond that. It’s the country’s whole history all smashed into one large maze of a room, so it will take every second it is worth to see it and then some. Once you’re done and you walk out the back of the hall, turn right to see the Gunboat Philadelphia. After all you just saw in the Price of Freedom hall, this will feel like an afterthought. But it is an important one, since the gunboat is one of the surviving vessels from the Revolutionary War. It was sunk, yes, in battle on October 11, 1776, but was raised in 1935 and is now displayed to help demonstrate the far reaches of the Revolutionary War – it wasn’t all fought on land, you know. From here, walk around the hall on the American Presidency to the one on the First Ladies. 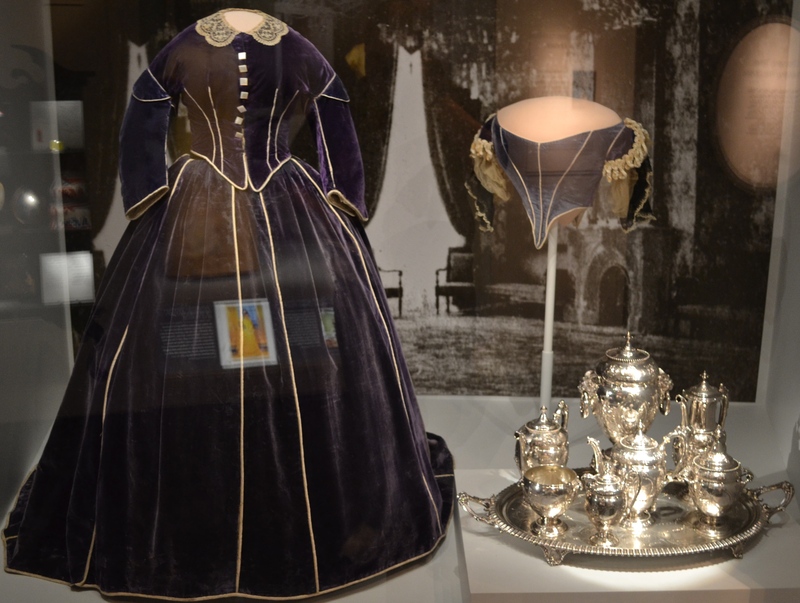 Take time to admire their dresses, noting how the styles changed through the years, and learn a little about the importance each of these women has played in the course of the United States during their time in the White House. It all is certainly interesting, particularly for those who are fascinated by history, but can be overshadowed if seen after the American Presidency. This hall, like the Price of Freedom, is worth every second spent in it. 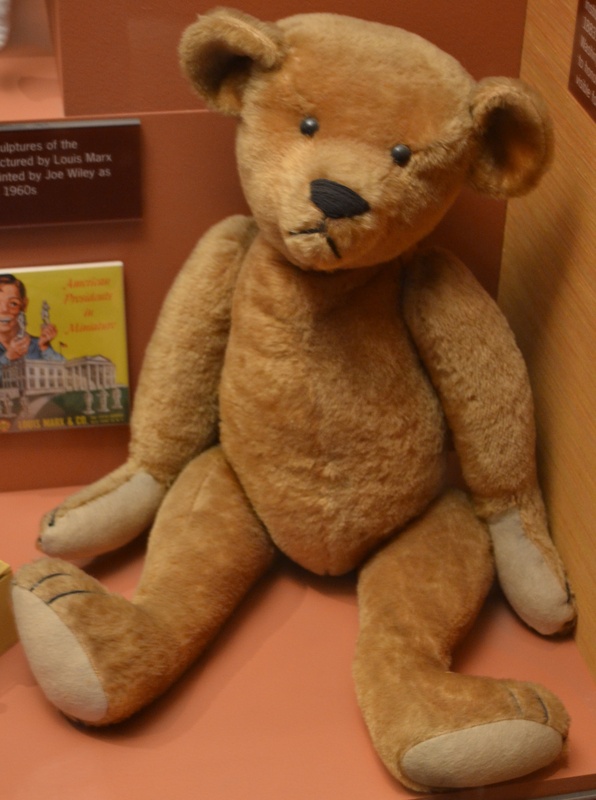 The items on display, like the teddy bear that came about when President Theodore Roosevelt refused to shoot a bear while out on a hunting trip, show a more personal side of the presidency. That is why, I suppose, President Warren G. Harding’s silk pajamas are also on display. But make no mistake, other more important historical items beyond teddy bears and p.j.s are here. This is where you’ll find the desk where Thomas Jefferson wrote the Declaration of Independence, the carriage Grant rode in to his second inauguration, and more. 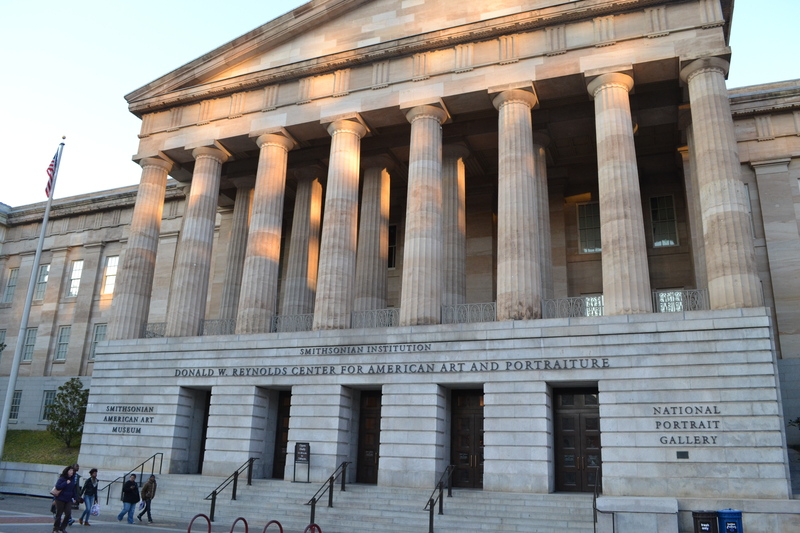 This building houses two separate museums, the National Portrait Gallery and the American Art Museum. And it’s best to visit them both late in the day, since they’re open longer than the other museums on the Mall. And once you’ve done it, once you’ve wrapped up with visiting the two museums, you’re in a great spot – the Penn District – to find a hip and happening restaurant or bar for dinner and a night out. First, though, the museums: the two museums are spread out in the building, but, generally speaking, the National Portrait Gallery is on the east side and the American Art Museum is on the west. The highlights can be found on the east side of the first floor, the second floor’s west side, and the third floor’s east side. That’s not to say, though, that the rest of the museum isn’t worth the time. There are several special exhibition halls, so what’s there will change from time to time. What I saw during my visit, which will likely be different for any future trips, was worth the time. So be sure to arrive early enough so you are not rushed. Portraits of several important personages to American history – none of whom were presidents – are on display on the lower level, east side. Notable names and portraits are Pocahontas, Thomas Paine, Amelia Earhart, Alexander Hamilton, Walt Whitman, Mark Twain (Samuel Clemens), Thomas Edison, Edgar Allen Poe, Frederick Douglass, and Benjamin Franklin. They’re all spread out in more than a dozen rooms as well as the hallway, so take your time to walk through and see each one. It’s definitely a learning moment, a time to pick up on some notable figures of American history who you may not have otherwise known by reading the information cards next to the portraits. From here, after following the hallway to the north side of the building, wander through the special exhibition halls on the west side and head up to the second floor. The highlight here is the gallery on America’s Presidents. It is located in the southwest corner of the second floor. 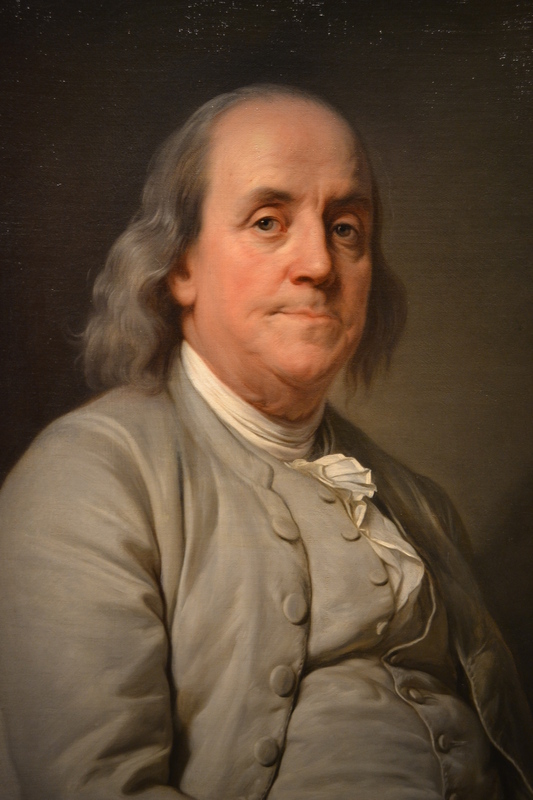 Here you’ll find a portrait of every president in the United States’ history, whether they be Democrat or Republican, Federalist or Anti-Federalist, Whig or whatever else have you. They’re all here, portraits of each and every one of them save President Obama. His has yet to be done and hung in the gallery. 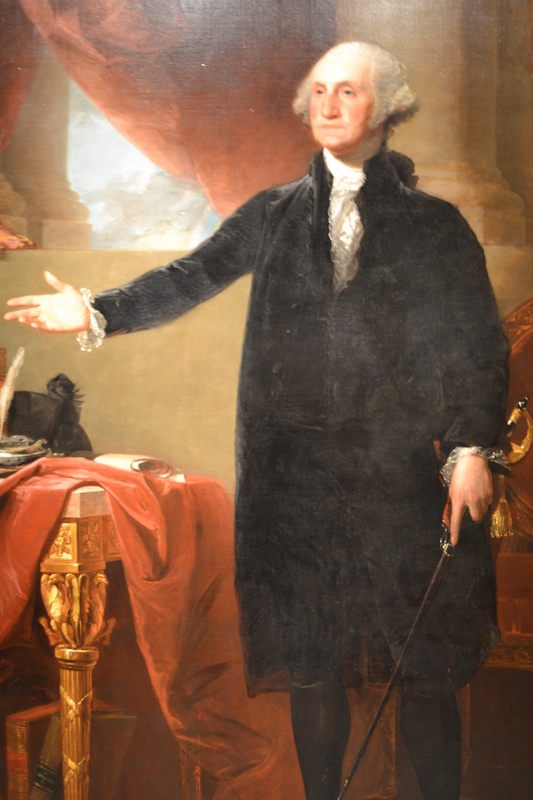 Most notably out of all of the presidential portraits is the one of President George Washington. A copy of this hangs in the East Room of the White House. But this is the one, the portrait Dolley Madison saved when the White House had to be evacuated as the British burned Washington, D.C. during the War of 1812. 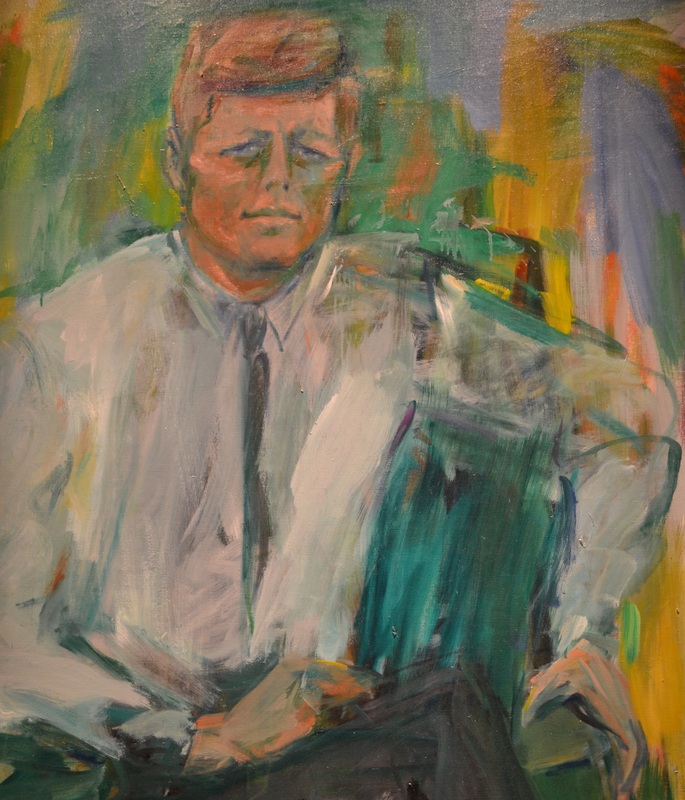 Other notables are Abraham Lincoln, most particularly his life mask, and the modern art images of both Presidents John F. Kennedy and Bill Clinton. Once you’re wrapped up in the gallery on America’s Presidents, continue on through another set of special exhibits in the west and north sides of the building. From there you’ll end up back in the east wing and a smattering of different styles of art in American dating up through 1940. Some of this is from the Civil War, others from the west, and still more from the colonies. It’s a mix and mash, so pick and choose what is of interest to you and then head up to the third floor on the grand staircase on the south side of the building, which is right above the main lobby. The third floor is filled with contemporary art and art from the 20th Century, all done by American artists, as well as some more special exhibitions and an interesting grouping of mezzanines in a library section of the gallery on the west side. 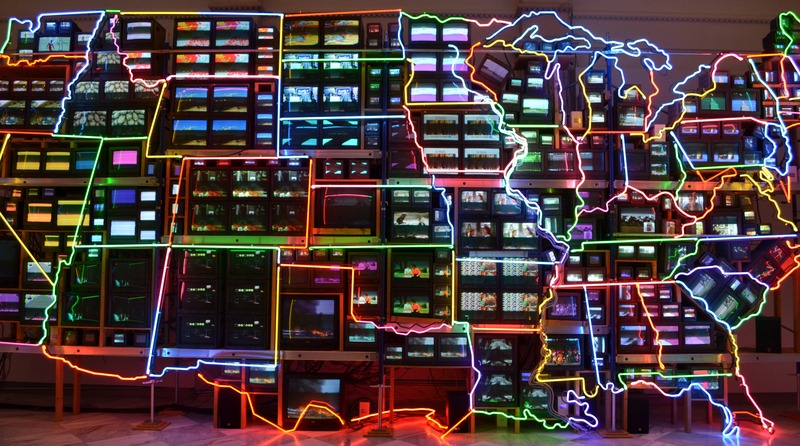 Out of all of it, my favorite, and probably the most talked about by others who have visited the museum, is Nam June Paik’s Electronic Superhighway. It is easy to find since it’s huge, but so you don’t miss it know that it’s located in the middle of the east side’s third floor. Due to my love of modern and contemporary art, I could have probably stared at Paik’s creation – a collection of televisions broadcasting in a manner of a cultural map – for an hour. As it was, the day was late and the museum was closing, so I had to leave. It was not without regret, either, since this was the last Smithsonian Museum I was able to visit in Washington, D.C. The next one, the last out of all of them I toured, is actually located in Virginia near Washington-Dulles International Airport. 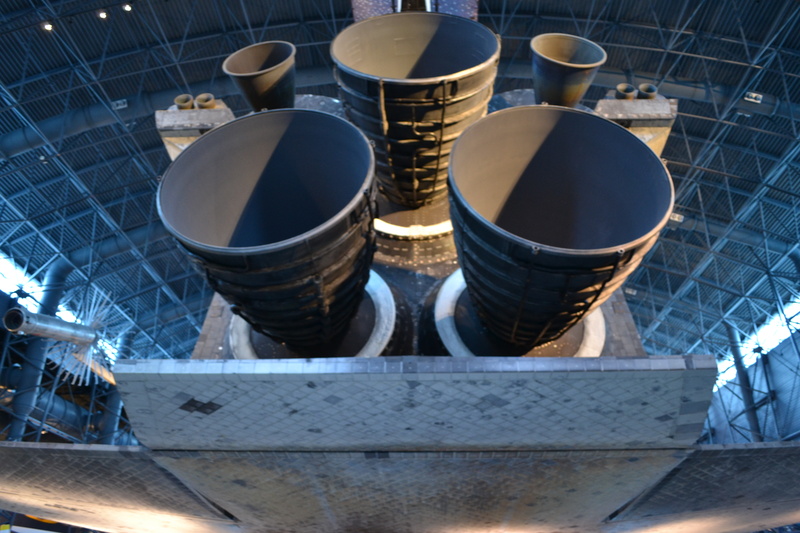 There are a handful of “must see” exhibits at the Udvar-Hazy Center. The rest of the aircraft and other exhibits on display are certainly interesting, but, with only a casual appreciation for such things, they likely won’t be of much interest to most visitors. The first two highlights, though, can be seen immediately upon entering the building. As soon as I walked through the doors and looked through the main hangar to an addition on the backside, my jaw dropped. 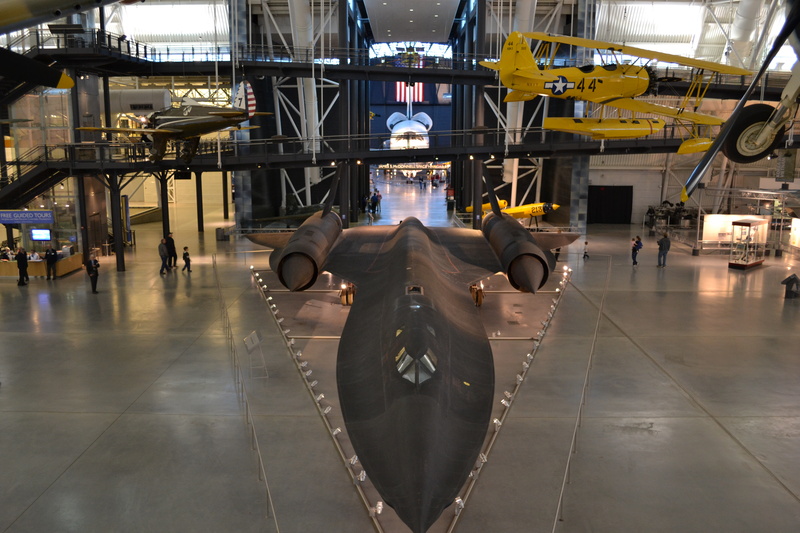 There was a Lockheed SR-71A Blackbird and the Space Shuttle Discovery one after the other. After taking a moment to check my luggage in a locker – the coins are returned when you retrieve your bags – and checking in at the information desk, I walked away from the two beasts. It wasn’t easy to do, but there was something that interested me more. And after walking past the café and around a corner, there it was, I found it, the Enola Gay Boeing B-29 Superfortress. The plan that dropped the nuclear bomb on “Little Boy” on Hiroshima, Japan at the end of World War II. World War II history has always interested me, but it wasn’t until I visited Wendover Airfield in Utah that I took an interest in the Enola Gay. There the team trained to drop the bomb. But here was the plane they actually flew. Part of me was elated over the historical significance of it all, but another side of me struggled with the horrific nature of what it did. The debate could continue forever, though; would the war have ended if the bombs weren’t actually dropped? I continued on the upper level, looking out at all of the amazing varieties of planes. It was astounding to think that this is probably only a drop in the bucket of all of the planes ever designed and built. There were so many of them, all with such an interesting history all their own. But without a greater knowledge of the mechanical workings of the planes, I could only look at them with a mild interest of such an amateur. 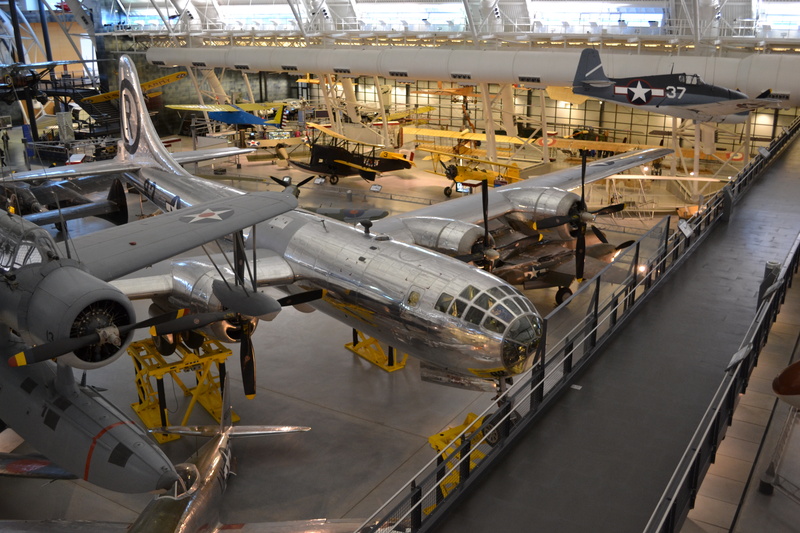 The pathway that brought me by the Enola Gay ended in an area overlooking a large restoration hangar. 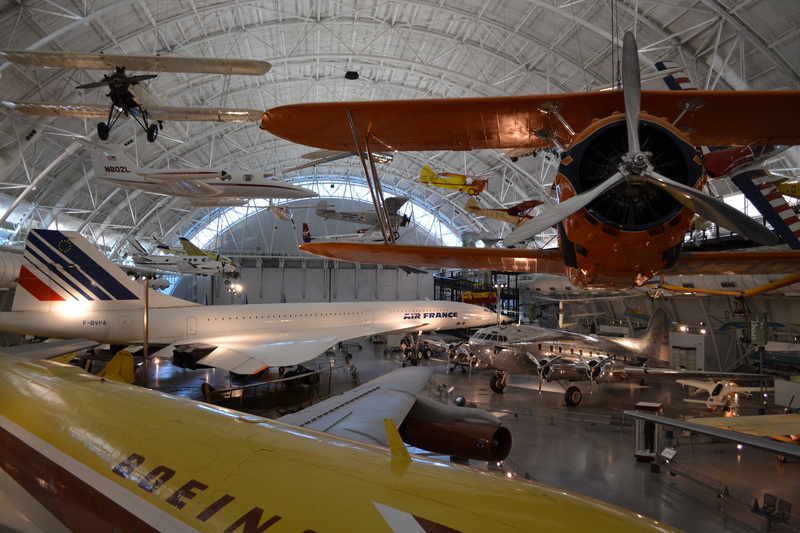 It is here where the planes are restored for historical preservation and, quite possibly, display in the Udvar-Hazy Center. 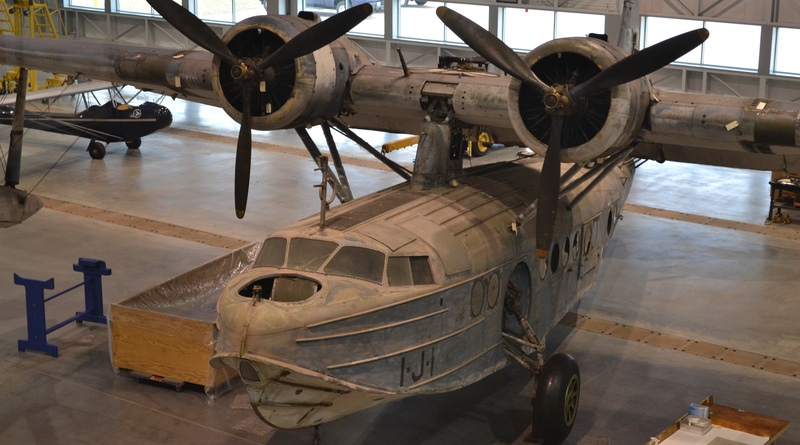 It was great to watch the two men work to put together a flying boat – Sikorsky JRS-1 – that was used to search for the Japanese fleet after the attack on Pearl Harbor. Although I couldn’t tell what they were doing, just watching them work on such an historical piece fascinated me. After I had my fill of watching the restoration work, I continued to the right and on to the James S. McDonnell Space Hangar. 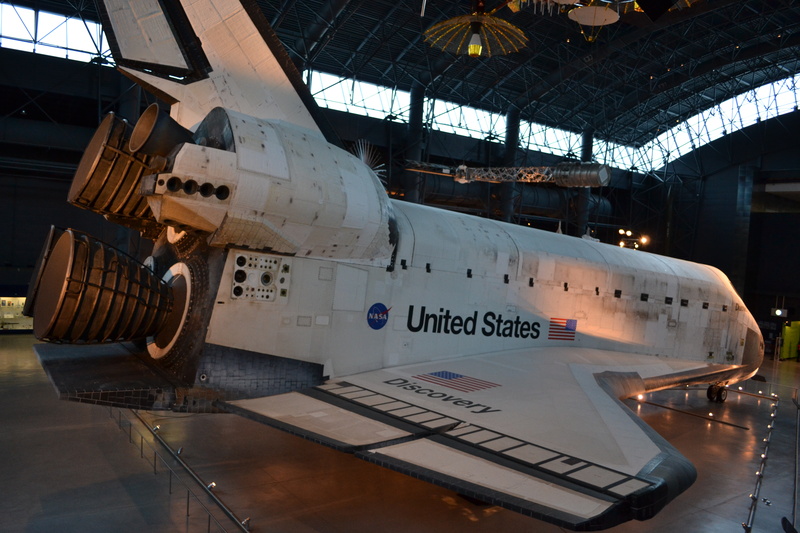 Here, in the back of the whole complex, is the second of my big highlights – the Space Shuttle Discovery. The sheer size of it astounded me; a man could stand in one of the jets and there’d still be plenty space! The thing was absolutely huge. Like most little boys, I wanted to be an astronaut when I grew up. Then I learned the ride was rougher than a rollercoaster at my local amusement park, so I gave up the dream for something a little more practical – and down to earth. 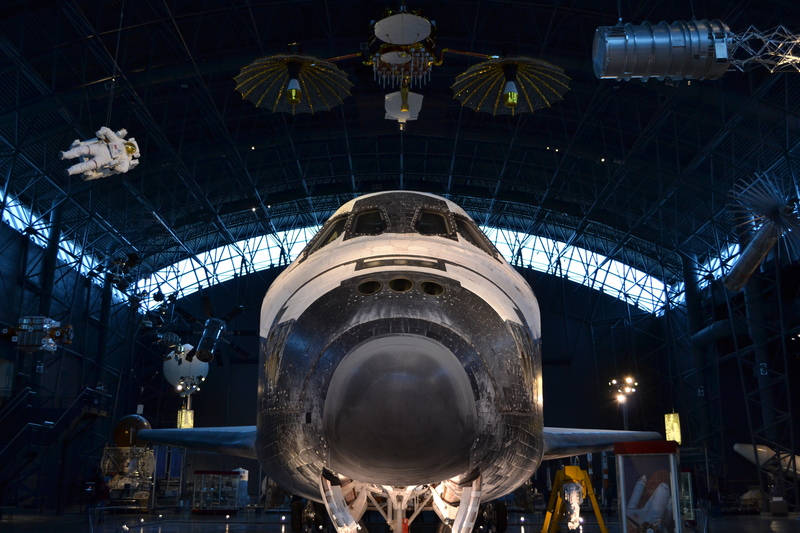 Nonetheless, the assortment of items on display – space suits, space arms, and more – interested me enough to spend at least an hour in the hangar around the shuttle. It was the most fascinating area for me, easily eclipsing its more popular cousin – the Air and Space Museum – on the National Mall. And it’s a shame, really, that all of these amazing items can’t be fit in there or brought to a more convenient location for the public to see. 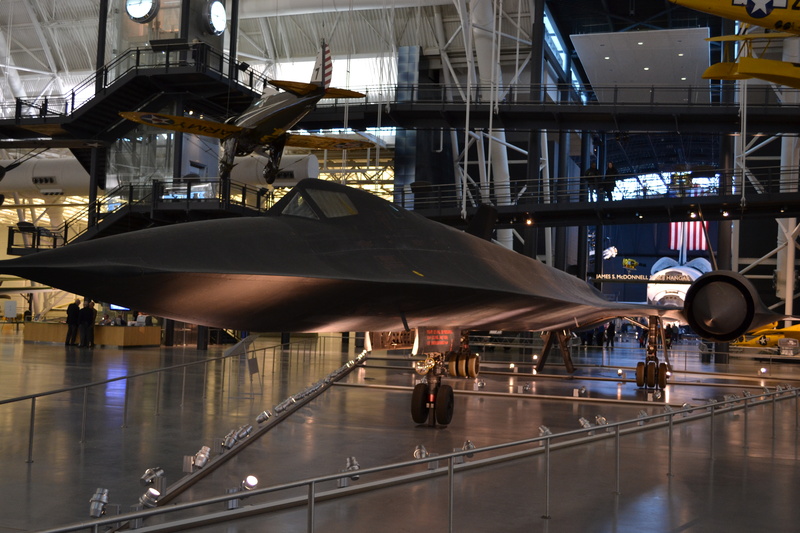 With that thought in mind, I continued back out to the SR-71A Blackbird. I had seen it in pictures and videos for years, but never imagined standing in front of one. Just like the Space Shuttle Discovery, the thing was huge. I was in awe of it. And I couldn’t take my eyes of the aircraft as I walked around it several times, ignoring all of the other items on display in the museum. At a point, though, I had to continue on. There was one last thing I had on my “must see” list, and I wanted to be sure I saw it before catching my flight home. The Concorde was visible from several different areas of the main hangar, its size large enough to attract attention from most anywhere. It is a jet that has fascinated me for years, because of the ease of travel it offered. Unfortunately it wasn’t exactly safe, otherwise it’d still be in service today. And that’s a disappointment, too, considering how easily people could travel on it from the United States to Europe. If only I could do that now, possibly avoiding the annoying jetlag in the process. With a sigh, I gave up on the dream and continued walking through the rest of the museum after taking plenty of time to admire the plane. Helicopters of all kinds, fighter jets, stunt planes, they were all on display either on the ground or hanging from above. Even though I didn’t understand a lick about how they worked, it was fantastic to see them all. A true treat that made me happy I took the time to stop at there before catching my flight out of Dulles. It was easily one of the best museums out of all of those curated by the Smithsonian, and most definitely the surprise out of all of them. I missed out on the chance to see several other Smithsonian Museums while I was in Washington, D.C. I wanted to go to them, to see the Postal Museum and the Renwick Gallery, but I ran out of time. And with so much else to do, I had to put off seeing the Anacostia Community Museum and the National Zoo as well. Just like the two Smithsonian Museums in New York City – the National Design Museum and another National Museum of the American Indian – they’ll have to wait for another time. With so much to see and so much to do, it’s impossible to fit it all in on one trip. What I did was truly a whirlwind, as is this brief guide, so if you want to know more, as I suggested above, pick up a copy of the Official Guide to the Smithsonian. It’ll be worth it. How? Well, I’ll discuss that in another upcoming story. Tags: Art, History, Museum, Travel, Washington D.C.
Jason, I’m overwhelmed with the diversity and volume of exhibits. It really is so much to take in. If I’m fortunate enough to go back to Washington in the near future I’ll have to block book about a week to see all this. I dare say the dinosaurs are quite an exhibit, there are so many fossils in the US. Another great post, well done. I’m truly amazed at your broad depth and knowledge of American history, you must be nearly 70 to know all that. Your descriptions leave me feeling like I just visited there myself. Thanks! I highly recommend all of the different Smithsonian Museums. There’s a lot there, no doubt hard to fit in one trip, but worth the time for at least the highlights.